Once again, I am thrilled to support another amazing book published by Walden Pond Press... Be sure to scroll all the way down to enter to win a copy of the book from the publisher. 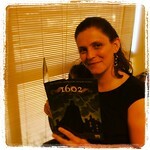 I received an advance copy of the book from the publisher, but my thoughts are all my own. I adored the fact that the Island had a library, and I loved trying to figure out which books they were discussing and reading. They don’t mention any titles, but some were obvious and some were trickier. I also loved that they gave books that completely fell apart a special burial. The kids on the Island knew how important and special books are, and even made sure that each child was taught to read and write. Some children are ready and eager to move into their teenage years. Those kids jump into middle school and barely wave goodbye to their little selves. That was absolutely not me. Jinny watching, puzzled, as Deen eagerly heads out into the unknown resonated with my own preteen self. Jinny spends the next year trying to figure out how she’ll know she’s ready… and then still isn’t. I was the child who wept when the older children were told they weren’t going to be able to go back to Narnia. I recognized that I was being pushed out of childhood, just like they were, and I was devastated. I love that this book showcases Jinny’s uncertainty. Not being sure you are ready to take on bigger responsibilities and explore the wider world is a perspective I think will also resonate with many of my upper elementary readers. I won’t give too much away, but I do want you to know that many of the mysterious elements in this book will not be resolved for you as a reader. Laurel Snyder gives us the chance to come to some of our own conclusions about the nature and history of the Island. This kind of open-ended narrative is powerful for readers, and leaves open the possibility of many rich discussions and “pondering” time. I debated whether or not to use the word feminist here, but I’m leaving it. To me, feminism is about allowing everyone the chance to take whatever role they want for themselves. Do you want to be a nurturer? It doesn’t matter what your gender is. Do you struggle with a nurturing role? It doesn’t matter what your gender is. Do you want adventure? You get the idea. 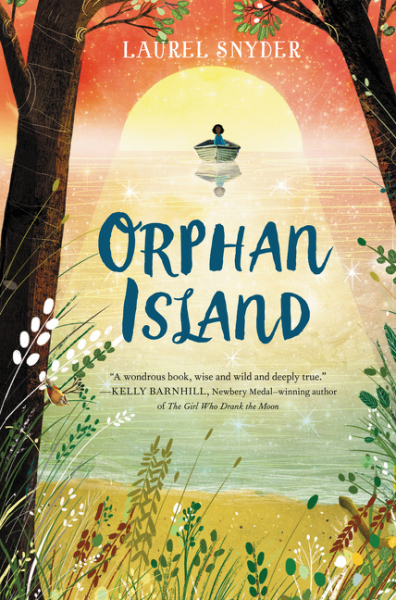 In Orphan Island, all of the children are expected to take their turn in every type of role. They all help gather food. They all help cook. The Elder orphan is expected to take on the youngest child as their “Care”; teaching and nurturing that child. Jinny struggles with her role as the teacher and nurturer, even though she absolutely cares about the little girl who becomes her responsibility. I loved seeing that. I also empathized with many of Jinny's concerns in her caregiving role. She was so cautious with her Care because she didn’t want to see the child hurt. We know that real learning requires risk, but it is so hard to let our children go into situations that could be dangerous in any way. I know that can be incredibly frustrating to our children, and maybe seeing Jinny have these same struggles will help them gain some understanding and empathy for their own parents. 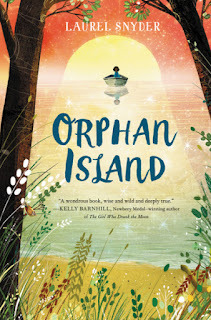 Overall, I absolutely loved Orphan Island. It was a tale that included adventure, wish fulfillment, and a touch of the mysterious. This book should appeal to students in 5th grade and up. 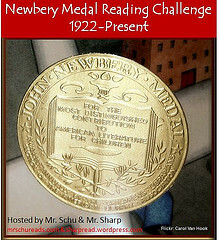 I can’t wait to have my students read it and see what they think! Laurel Snyder is a poet, essayist, and author of picture books and novels for children, including Orphan Island, Charlie and Mouse, Bigger than a Bread Box, and Swan, the Life and Dance of Anna Pavlova. 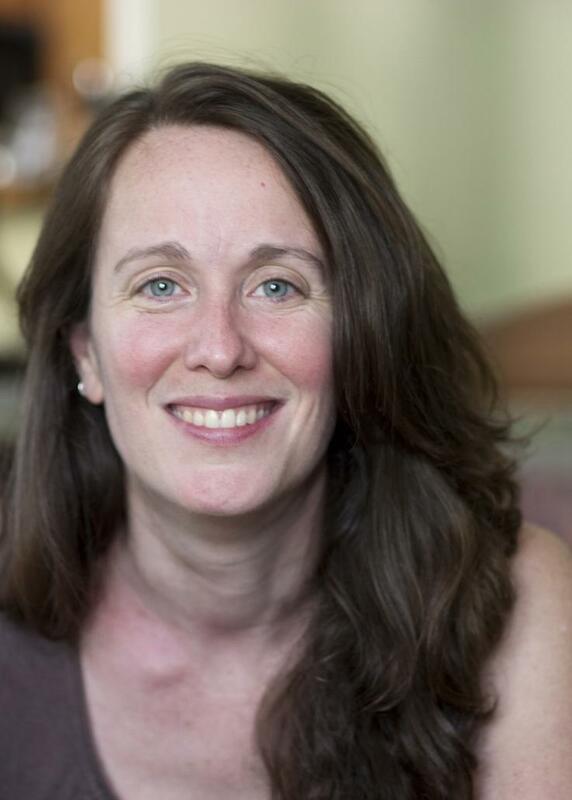 She is also a graduate of the Iowa Writers’ Workshop, and a faculty member of Hamline University's MFA in Writing for Children and Young Adults. She lives in Atlanta with her family and can be found online at www.laurelsnyder.com. Check out the other tour stops for more information and other chances to win!